E-mail marketing is one of the most effective and profitable marketing channels available to small businesses. It is a proven way to both nurture leads and create long term relationships with existing customers. The biggest hurdle on the path to e-mail marketing success is building a list of e-mail subscribers. With the average e-mail list degrading by over 20% per year, you need to consistently add new subscribers to you e-mail list to maintain an active and engaged following. Without an active and engaged list of e-mail subscribers, your e-mail marketing strategy will fall flat. So how do you do it? Whether you’re just starting your e-mail marketing strategy, or your list is simply not growing as fast as you would like, here are 9 ways you can start building your e-mail list today. The first, and most common, way to build your e-mail subscription list is to add opt-in forms to your website. Opt-in forms are short contact forms where visitors can submit their name and e-mail address to “opt-in” to receive newsletters or other marketing materials. Text – When writing the title for your opt-in form, focus on the benefits your customers will gain as a result of signing up for your newsletter. With so much spam e-mail filling up the average e-mail inbox, people have become very wary of giving out their information. Instead of simply asking them to sign up, give them a good reason to. People are much more likely to sign up for something if they have a clear idea of what is in it for them.For example, if you run a food blog, “Sign Up For Weekly Free Recipes” is a much more compelling title for an opt-in form than simply “Sign Up For Our Newsletter”.Don’t stop with the title though. Reinforce your message by changing the text on the “submit” button on your form as well. Taking the example from above, changing the default text from “Submit” or “Sign Up” to “Get My Free Recipes” adds much more value to potential subscribers. Opt-in forms are one of the easiest and most effective ways to quickly grow an e-mail marketing list. Note: To avoid heavy anti-spam fines, be sure to keep CASL guidelines in mind. Lead magnets are pieces of downloadable content given away in exchange for the contact information of website visitors. They are available to view only after visitors have filled out an opt-in form. Lead magnets are a great way to grow both your e-mail newsletter list and generate leads for your business. For them to be effective though, you need to make sure that your website visitors will actually want to download them. If nobody cares, nobody will download your content and you won’t generate any new subscribers. Once you’ve chosen what to give away, build a dedicated landing page to capture e-mail addresses. For tips on building high converting landing pages, check out our article on proper landing page design. 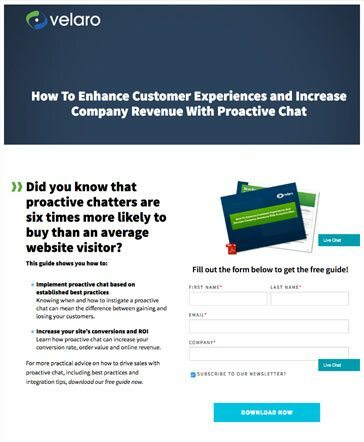 Well designed landing pages are a great way to generate targeted leads and e-mail subscribers for your small business. Although they can be some work to set up, lead magnets are one of the best ways to generate a steady stream of targeted leads and newsletter subscribers. Blogging is a great way to bring targeted traffic to your website. It is also a great way to grow your e-mail subscription lists. The best way to convert your blog readers into e-mail newsletter subscribers is by simply adding opt-in forms right in the middle of your blogs. If your blog content is engaging and informative, your readers will naturally want to come back and read your latest articles. Adding an e-mail subscription form with a compelling call to action to all of your blog posts is easily one of the most powerful ways to quickly build an e-mail marketing list. Promoting it on social media. Adding a link to it in your e-mail signature. Adding links to it in your social media profiles. Advertising it on social media and search engines. Social media is a great tool to increase the brand awareness and customer loyalty of your small business. It also presents an opportunity to convert some of your followers into e-mail subscribers. Fortunately, some e-mail marketing tools like Mailchimp allow you to add e-mail opt-in forms directly on your Facebook Page. These forms can be fully customized and appear on your Facebook Page as a custom tab. Custom opt-in tabs are a great way to convert your Facebook traffic into e-mail subscribers. Want to grow your e-mail marketing list quickly? Run a contest on social media where participants enter by submitting their e-mail addresses. 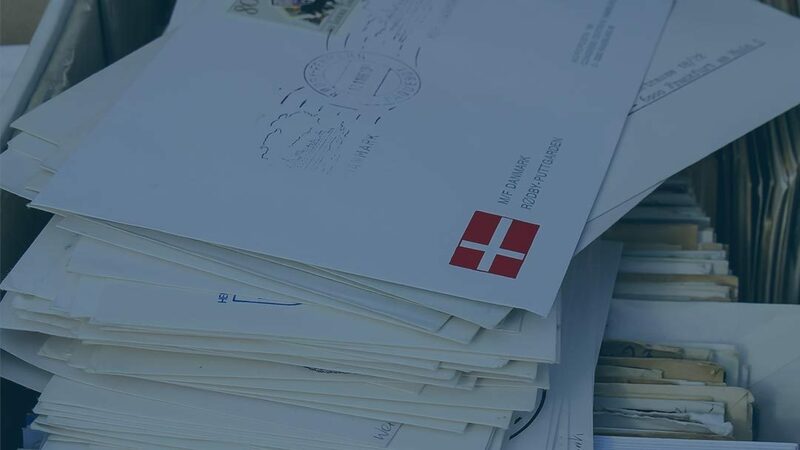 While contests like these can get you a ton of e-mail addresses in a short amount of time, the e-mail addresses you get will be lower quality than those you get from lead magnets or opt-in forms. This is because many people enter contests simply for the prizes and have no intention of ever doing business with you. The key to combating this is to pick the right prize. Avoid generic prizes like gift cards or movie tickets in favour of things that only your ideal customers will be interested in. Your e-mail newsletter opt-in efforts don’t have to be confined to the online world. Add a simple paper signup sheet by your cash register and encourage everyone who makes a purchase to sign up. You can even offer a small discount or giveaway to those that do sign up. Your offline efforts don’t need to be confined to your retail showroom however. Bring e-mail sign up sheets to trade shows, workshops, networking events and anywhere else where you may run into potential customers. One of the most effective ways to build an e-mail marketing list is to leverage your existing e-mail subscribers. The easiest way to do this is by adding “forward to a friend” links to your e-mails. A “Forward to a friend” link is a hyperlink that encourages your subscribers to share your e-mails with their friends and family. When clicked it will open a webpage where they can enter their friend’s e-mail address and a message. The chosen recipient will then receive an e-mail from their friend with their chosen message and a link to your e-mail. 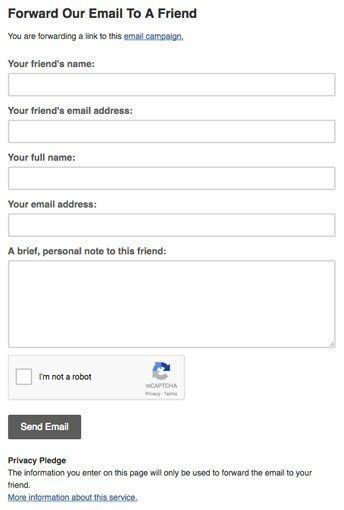 When someone clicks the “Forward To A Friend” link they will be redirected to a form like this where they can enter their friend’s information and send them a copy of your e-mail. Before we finish this discussion on growing your e-mail list, I thought I’d quickly discuss one e-mail list growing technique that you shouldn’t use, buying e-mail lists. Buying e-mail lists is a bad idea for a few reasons. First and foremost it doesn’t work. E-mail lists that are for sale are usually very poor quality, being mostly made up of people never open up marketing e-mails. The people on that list will also likely have no idea who you are. If you were e-mailed by a company you didn’t know how likely would you be to respond? Secondly, anti-spam laws have been put in place to stop practices like this. There are now entire organizations who’s job it is to prevent spam e-mails being sent. If one of these organizations sees that you’ve been buying e-mail addresses, your e-mail addresses will be flagged as spam. This will severely hurt the deliverability of your e-mails, sending most if not all of them directly into the spam folders of your customers. While it is the fastest way to build an e-mail list from scratch, buying existing e-mail lists is never a good idea. While e-mail isn’t always the most exciting marketing channel, it consistently delivers results; producing the highest ROI of any marketing strategy. Without a good e-mail list however, e-mail marketing simply doesn’t work. With e-mail lists degrading by over 20% every year, you need to constantly add new e-mail addresses or your list will slowly become worthless as people change e-mail addresses or opt-out of your list. To succeed with e-mail marketing requires doing a lot of little things correctly. While any one of these techniques might not make a big difference on their own, when combined they can produce real results.